We received word today, Oct. 5, that renowned English woodworking author and teacher, David Charlesworth, was stricken with a serious illness while teaching in Germany and is in dire need of our assistance. David is in need of an ambulance flight back to England but is not in position to cover the expense of one. We would like to encourage those in the woodworking community who are able to do so to make a donation of $1 to $10 to a fund for that purpose. Donations can be made via Paypal to David’s assistant John at jklweb@lineone.net (through Paypal). Highland Woodworking will also be contributing to the cause. This blog is not about sales or in support of any marketing attempt for monetary profit. This is an attempt to give back with your help. 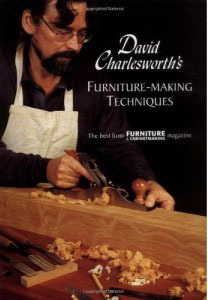 We have a world renowned author, teacher, furnituremaker and woodworker, David Charlesworth, that has done much for the woodworking industry, who now requires our help. If I had to state on word that drives or represents woodworkers and their accomplishments, that word would be “inspiration.” David has been, and still is the epitome of inspiration for many through his woodworking talents. He now requires our inspiration and giving back to him. David was teaching woodworking classes in Germany, when he was rushed to the hospital with respiratory problems, and other health complications that affect his ability to survive. We all know what it means when we cannot do our craft, as David is currently in condition, unable to continue doing what he does best. Without that ability, he acquires no income. His wife Pat, a retired school teacher with limited funds, is trying to handle it all. That’s where we all come in as a family of woodworkers. I have found that woodworkers do more than just woodwork. Most, if not all woodworkers that I have encountered in my travels, have given back in some way to children, medical causes, the indigent, universities, home school woodworking programs, other woodworkers, communities; all with personal money, time and attention. David needs our help right now, and time is of the essence. If you can donate a contribution, it will all add up to help David. Your heart-felt gift will not only help with his medical bills, but relieve part of the heavy burden a situation like this puts on a person and a family. When mental and physical well being need to come together to support the healing process, help from the outside can be instrumental in accomplishing a healthy recover. You can also order his DVD’s and books through David’s site: www.davidcharlesworth.com. Please feel free to spread this word on David’s behalf, and please keep David in your prayers. Thanks in advance from all of us. I’m sure you’ve done your due diligence in checking this out but it sounds an awful lot like a scam that’s been going around. In the scam someone whose email has been hacked sends out a plea to their mailing list saying that they were somewhere abroad and got mugged and lost all their cash and credit cards. They need help form their friends to get a new passport and rebook passage home. This isn’t exactly like that but my “Check It Out” alarm is going off. Thanks for expressing your concerns – we have a personal connection to David Charlesworth and have confirmed all the details with his own personal contacts. He was ill enough that he was not able to attend Woodworking in America this year, and it would take a pretty serious illness to keep him away from that woodworking mecca. For anyone else who has similar concerns about this being a ‘scam’, please be assured that we have confirmed all the details and this really is just about a woodworker in need. Sent a donation through PayPal. Wish I could do more. We are praying for David. May all of his woodworking colleagues join us in supporting him and his wife in this difficult time. I urge everyone to send whatever they can to help with expenses. I needed a medical emergency flight myself about four years ago. It cost over $7000. I could not have made it without the help and prayers of my friends and family. Lorenzo & Andrew – thanks so much for your donations. I know David and his family will sincerely appreciate it. Now let’s keep our fingers crossed that he pulls through okay! Please let me know of a bank account to send a wire transfer or make it possible to send a contribution through David’s website, as if purchasing. I don’t think whoever does the work on David’s website (it might be David himself?) is focusing on setting up a donation request from the website itself – this will have to be a homegrown effort at this point. I believe you can contact David’s representative John directly at jklweb@lineone.net if you would like more details on how to donate. The Plane Facts: The Lie-Nielsen No. 60-1/2R(N) Low Angle Rabbet Block Plane The New issue of Wood News is Now Available!